Mexican police linked to mass murder? 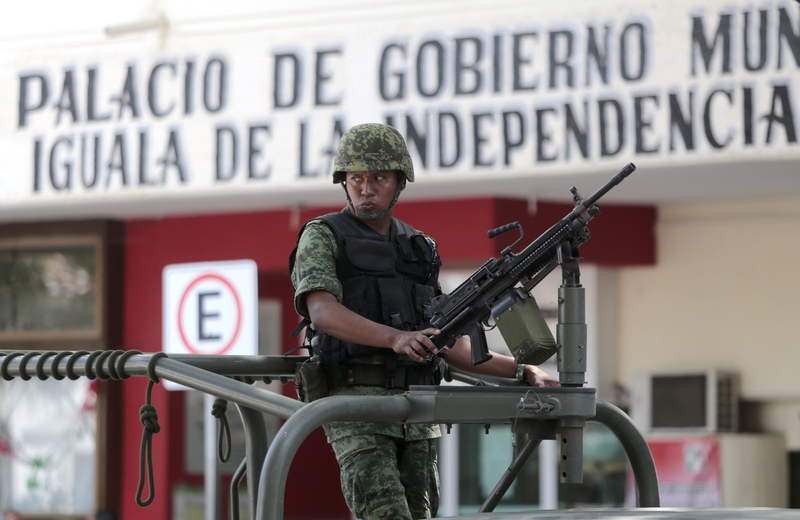 IGUALA, Mexico -- Mexico sent federal agents to take over security in a troubled city in southern Guerrero state after the discovery of a mass grave and charges that local police conspired with a criminal gang to kill and disappear students. The newly created preventative unit of the federal police was tasked Monday with keeping order in Iguala and helping search for the 43 students still missing following the Sept. 26 attack, in which six people died. As state officials worked to determine whether any of the missing were among 28 bodies found over the weekend in a clandestine hillside grave, President Enrique Pena Nieto called the deaths "outrageous, painful and unacceptable." Pena Nieto said he dispatched federal security forces to "find out what happened and apply the full extent of the law to those responsible." Guerrero State Prosecutor Inaky Blanco said so far there was no known motive for the attack, but officials have alleged that local police were in league with a gang called the Guerreros Unidos. Investigators said video showed officers taking away an undetermined number of students, who had gone from a rural teachers college in Ayotzinapa to the city to solicit donations. Speculation abounded among parents and local residents as a banner appeared in the name of the Guerreros Unidos. It demanded that 22 police officers detained in connection with the attack be released within 24 hours, and warned of consequences otherwise: "The war has started." The federal takeover came amid rising international concern over the Iguala incident and another possible case of a mass killing involving Mexican authorities. An army unit is under investigation and three soldiers face homicide charges in a June 30 confrontation that killed 22 suspected gang members in neighboring Mexico state. The army originally reported that they died in a gun battle after soldiers on patrol came under fire, but a witness told The Associated Press that 21 of them were killed after they surrendered. In Guerrero, Blanco said the bodies in the mass grave are badly damaged and genetic testing could take two weeks to two months to identify them. A person detained in the case had told investigators that 17 students were taken to the site outside Iguala, about 120 miles (200 kilometers) south of Mexico City, and killed there, he added. On Monday, Iguala's remaining police force was sent to a training center, and officers' weapons were to be checked for evidence of being used in crimes, said National Security Commissioner Monte Alejandro Rubido. Guerrero Gov. Angel Aguirre charged last week that the majority of police in his state have been coopted or infiltrated by organized crime. Former anti-drug prosecutor Samuel Gonzalez said it was possible that traffickers suspected the students had been sent by a rival drug gang. Manuel Martinez, spokesman for the students' families, denied they had any links to organized crime. But the Ayotzinapa school has long been an ally of community police in the nearby town of Tixtla, and Martinez said that, along with the teachers union and the students, it had formed a broad front to expel cartel extortionists from the area last year. Authorities have presented charges against 29 people. Three suspects are fugitives, including Iguala's police chief. Parts of Guerrero are controlled by vigilante-style community police forces, some believed to have ties to leftist guerrilla movements. Drug traffickers sometimes form their own pseudo-vigilante groups, and the state is torn by ancestral land conflicts, illegal logging and mining interests that create a powder keg for potential conflict. The mother of 17-year-old Luis Angel Abarca Carrillo said he had enrolled in the Ayotzinapa school to get ahead in life and not be a poor farmer like his brothers. "But now look what they did to him," said Margarita Carrillo, 60. "He hasn't reappeared."